The Castle Rozafa in Albania (Albanian: Kalaja e Rozafës / Kalaja e Rozafatit) is a castle near the city of Shkodër, in northwestern Albania. 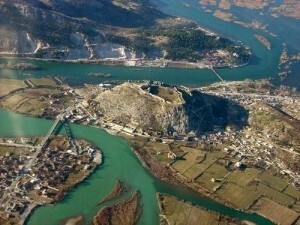 It rises imposingly on a rocky hill, 130 meters above sea level, surrounded by the Bojana and Drin rivers. Shkodër is the capital of the District of Shkodër, and is one of Albania’s oldest and most historic towns, as well as important cultural and economic centers year. Rozafa Castle in Albania is perhaps the most famous landmark of the city despite the fact that it is located outside on a hill 133 m high. Archaeological excavations have shown that prominent landform has been inhabited since the early bronze age, and what seen today are traces of venetian occupation period. Between its massive walls are hidden several administration buildings like venetian church of St Stephen, built in two stages in the thirteenth and fourteenth centuries, and a bell. Castle Rozafa in Albania is rightly one of the largest and most fascinating castles in the country. 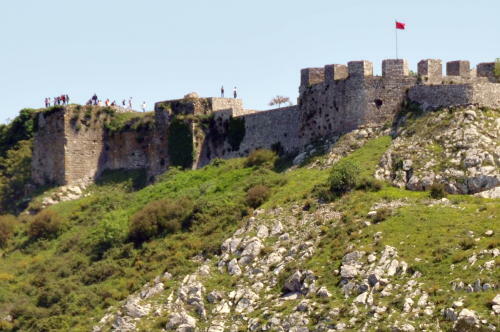 Built, destroyed, re-built since the roman empire, the Castle Rozafa in Albania became a high place of the war against the Ottomans in the 15-16 century. The castle get its name from a woman sacrificed in order to build this castle. This legend is quite important in the Balkan area as you can find different versions from Greece to Montenegro, or in Serbia or in Bulgaria. My personal recommendation is to go visit the Castle Rozafa in Albania in autum, when the castle is empty. Have a look to one of the oldest Albanian flag and the Rozafa sculpture. Walk along the walls to enjoy the beautiful landscapes around. You can easily reach the Castle Rozafa in Albania from Tirana by using buses or mini-buses for something like 100 lek (buses) or 500 lek(mini-buses). It will take you betwenn 1h30 and 2hours. You can visit the Castle Rozafa in Albania in two hours. It’s not that there is so much to see or read inside, but the landscapes around are quite wonderful. The guide in the museum (at the end of the opposite side of the entrance) speaks quite a good french and english. 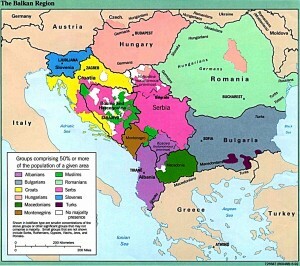 Might be helpful when most of the explanations are in Albanian. A meal in a restaurant is quite cheap. You can try a glass of Raki, Pilaf Djathe, and two or three qofte. You might not pay more than 300 lek. On the main street, close to the round-about and Rozafa Hostel, in direction to Tirana, you will find the most normal Albanian restaurant. The Castle Rozafa in Albania and its surroundings form an Archaeological Park of Albania.